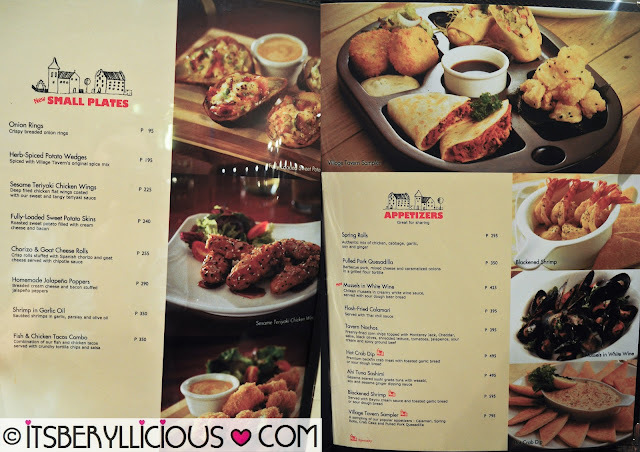 After our sumptuous Korean feast at Bulgogi Brothers brought to us by The Bistro Group, we were once again welcomed to try classic American dishes at Village Tavern in Bonifacio High Street. Village Tavern is the newest member of The Bistro Group which specializes in burgers, steaks, fish, whole wheat flatbreads and pizza. Responsible for the new and exciting dishes at Village Tavern is the new corporate chef for Bistro Group, Chef Josh Boutwood. 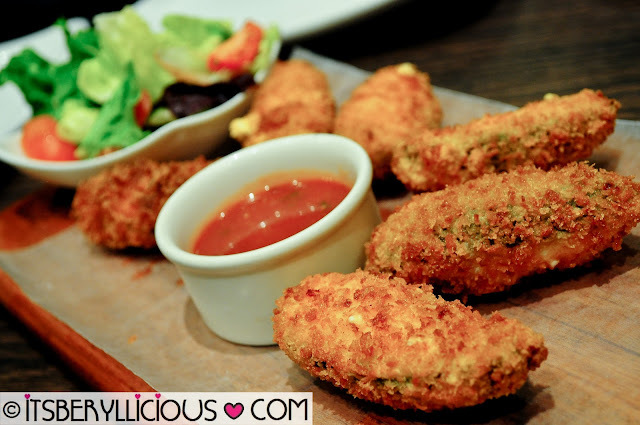 Perfectly breaded jalapenos filled with cream cheese and bacon. Crisp, creamy, a tad spicy and oh so good. Served together with a salsa dip and salad on the side. 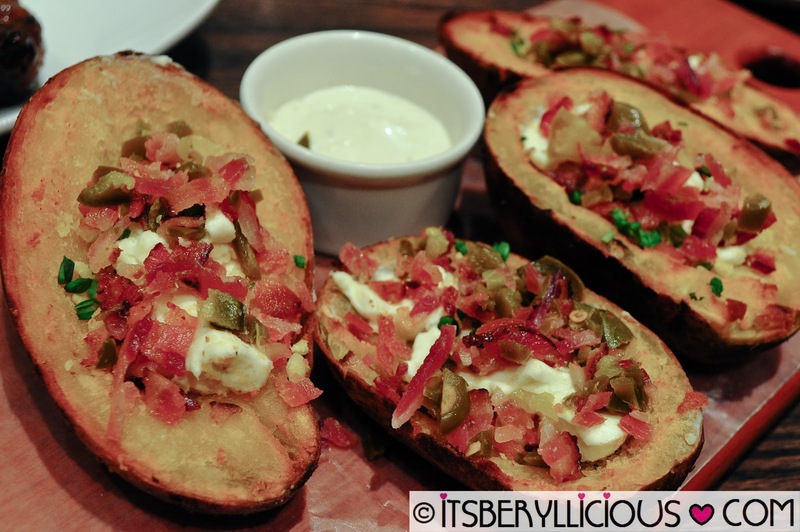 And if you haven't had enough of cream cheese, jalapeño and bacon, then try out Village Tavern's interesting twist to the classic potato skins. For this appetizer, they made use of sweet potatoes which I found better than the regular white potatoes. Filled it up with cream cheese on the center topped with jalapeño and bacon bits and there you have it, Fully Loaded Sweet Potato Skins. A plate of wings glazed in sweet and savory sesame teriyaki sauce with oriental notes. 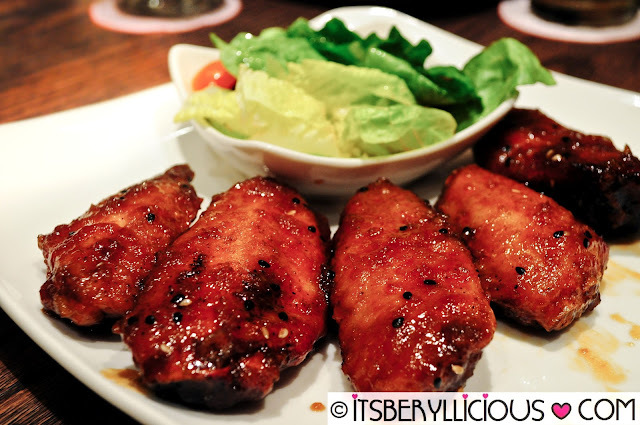 Although I prefer drumettes for my wings, Village Tavern's flat wings were juicy and flavorful inside and out. 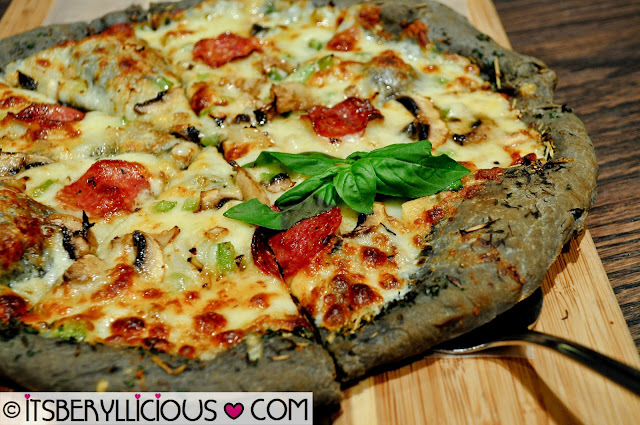 Village Tavern's new pizza offering is this Black Pizza made from squid ink especially created by Chef Josh himself. His recipe originally uses charcoal to make the black dough but due to limited resources and diners who are reluctant at the idea of charcoal in their food, he used the best alternative which is squid ink. Topped with pepperoni, mushrooms, bell peppers, onions and three cheese favorites-parmesan, gruyere and mozzarella, the pizza was indeed loaded with toppings that are truly classic. 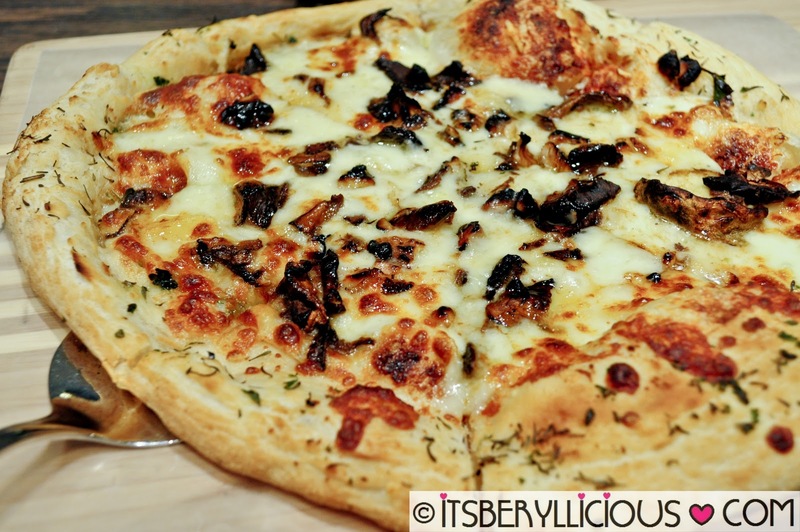 Another pizza we got to try was this Forest Pizza of wild mushrooms and walnuts in Asiago cream, Parmesan and Mozzarella cheese with aromatic essence of truffle oil. Both pizzas were pleasing to the palate with crispy yet not too thin crust. While one was a unique and overloaded with toppings, the other was classic and simple but loaded with creamy and cheesy goodness. 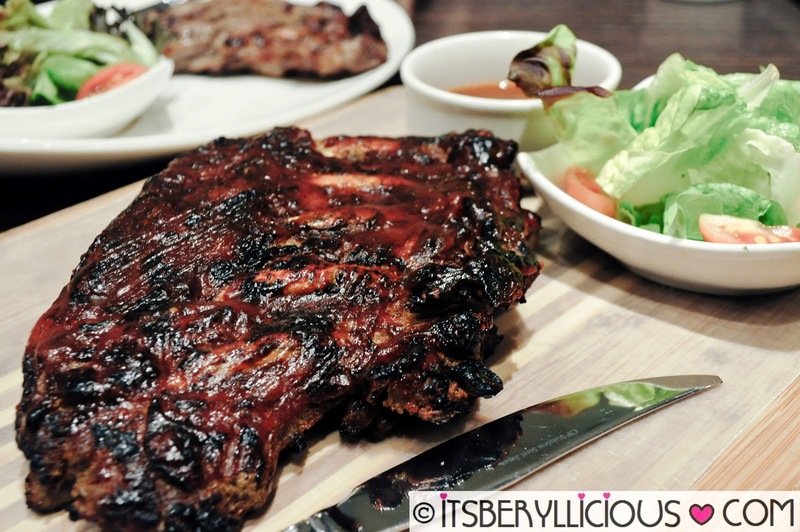 Aside from buffalo wings and cheesecake as my favorite comfort food, baby back ribs also tops my list. Village Tavern's version didn't fail me as the rack of almost-fall-off-the-bone grilled pork ribs was a delight to my appetite. The rack was beautifully charred with chipotle glaze and subtle dose of cola for that sweet and tangy flavor leaving the meat tender and juicy. This one reminds me of The Real Things Diner's Coca-Coala Baby Back Ribs that I super love. Sadly, they closed down in Il Terrazzo. Aged, hand-cut and grilled to perfection- using only the highest quality prime beef from superior beef cattles in the U.S. Treat yourself to a Great Steakout with Village Tavern's irresistible promo of 40% off on steaks every Friday-Sunday until supplies last. 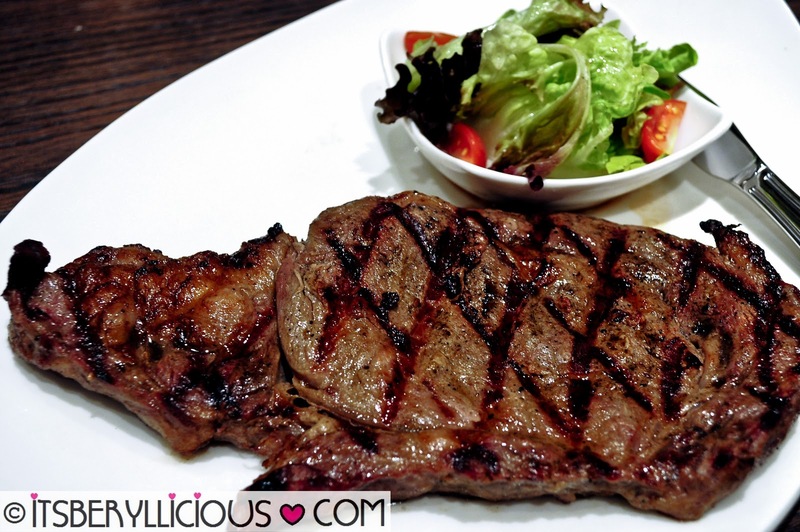 Go ahead and spoil yourself with this tender, juicy, mouth-watering and succulent premium beef steak that will certainly leave you craving for more. And if everything seems not enough, try Village Tavern's famous Cowboy Burger- Thick and juicy all-beef patty topped with melted cheddar, sweet and tangy barbecue sauce, strips of bacon and caramelized onions in sesame bun. Reminds me of the delicious Cowboy Burger from Wingman, but this was certainly better. An order is also served with really addicting crunchy orange sweet potato fries and honey mustard dip. Seriously, I just can't get enough of the sweet potato fries. 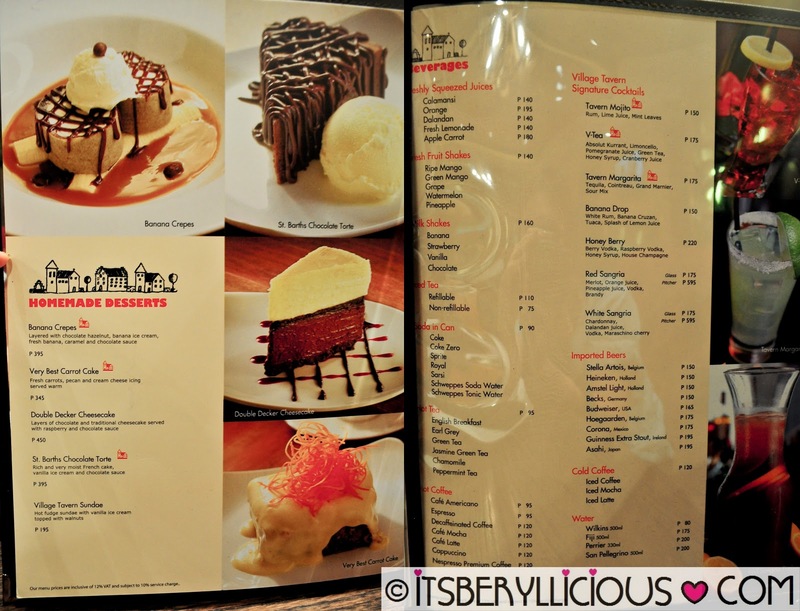 Feast over Village Tavern's delectable homemade cakes and desserts to satisfy one's sweet tooth. 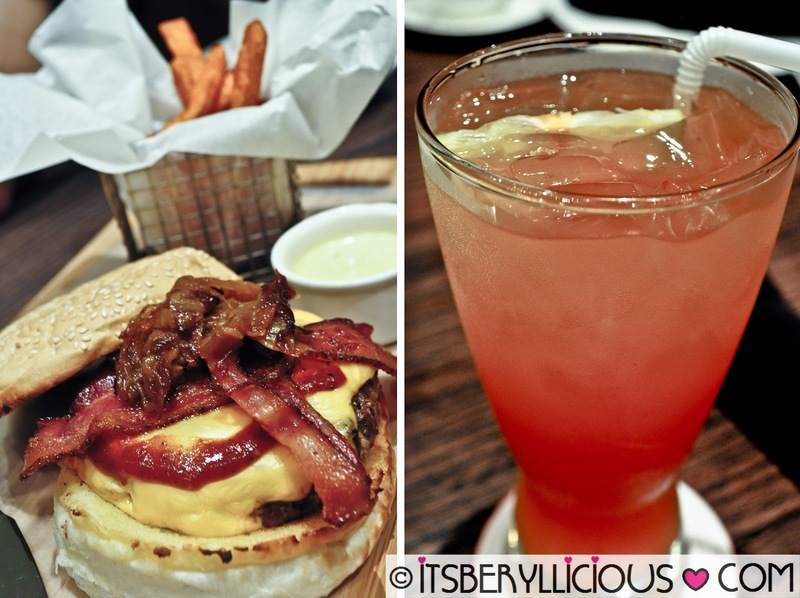 Village Tavern serves Classic American comfort dishes suitable for the whole family. Delectable plates of appetizers, healthy and hearty salads and soups, pasta and pizza selections, mouth-watering burgers and sandwiches, succulent premium beef steaks, sweet and delicious desserts and a wide range of drinks for a night of get-together and celebration. What more could you ask for? DELICIOSO!!! 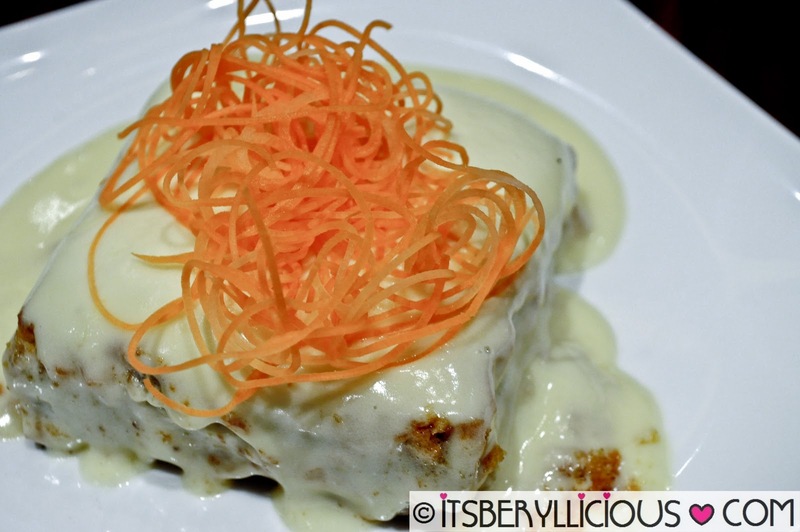 I enjoyed seeing the food photos and probably, these foods are mouth-watering!! Your photos makes me crave to try out the real thing which I'll do once I'm in High Street. Oooohhh!!! 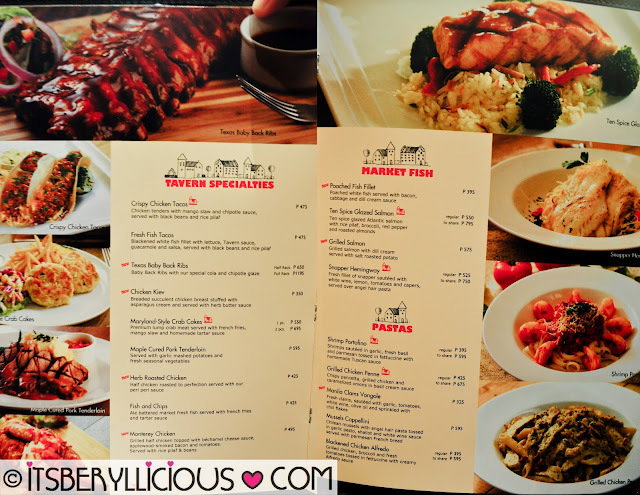 The forest pizza and ribs look so scrumptious! I know now where to head over for lunch next week while I'm there. 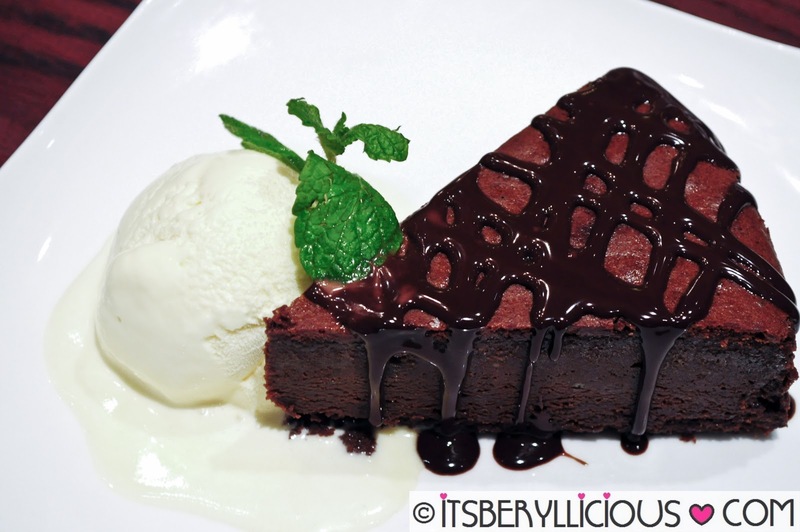 Sumptuousdishes and desserts here. I like to try having that Black pizza. i want that black pizza and desserts!!!! everything actually looks yummy and mouth watering. 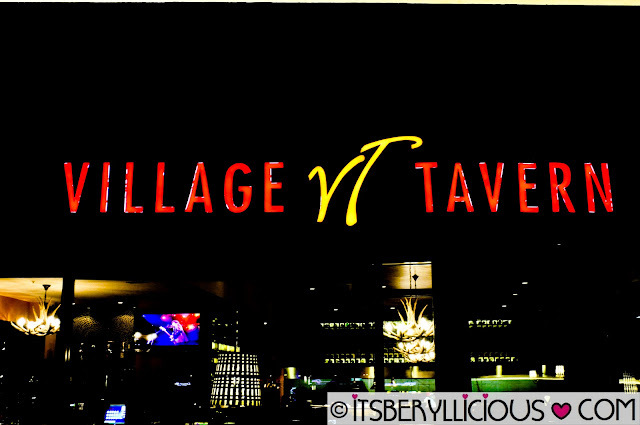 would love to visit vlllage tavern soon! BLack Pizza??? This is new to me. A must try food! I'm intrigued about the Jalapeno poppers! Mukhang masarap!! :) Actually they all looked so yummy!!! And I am drooling, looking your pictures. I not's a good idea reading blog about food during midnight, it tends me to crave in this unholy hours. I love that potato stuffed with bacon and cream cheese, very creative. Two words: Food Overload! That was a mouthful.. starting from the appetizers all the way to the main course. Oh, I could actually see myself trying out the steaks! I wanna go back here with some of my close friends. 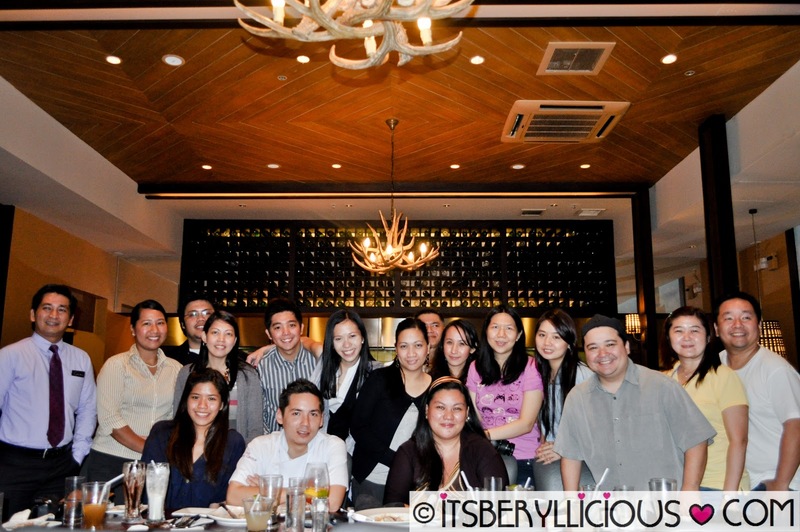 Wanna take them to a great gastronomic adventure as this one. Everything is to die for. I love your shots! will check that on our upcoming monthsary. 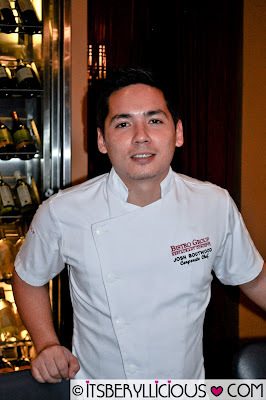 My girlfriend told me thta Chef Josh is so hot. I envy your experience here. Im also hoping to be invited to places like these. the pics really makes me hungry, i hope i can visit this place someday. Oh, I wanna try that Black Pizza! Something new... I wonder how it taste. The food are just mouthwatering!! I hope they would release vouchers for this and I may ask, do you recall if they do have high-chairs for toddlers? I'm a pizza lover and I'm curious about that black pizza, never heard of it before and it looks appetizing. GRABE!! I can't wait to try this bistro. 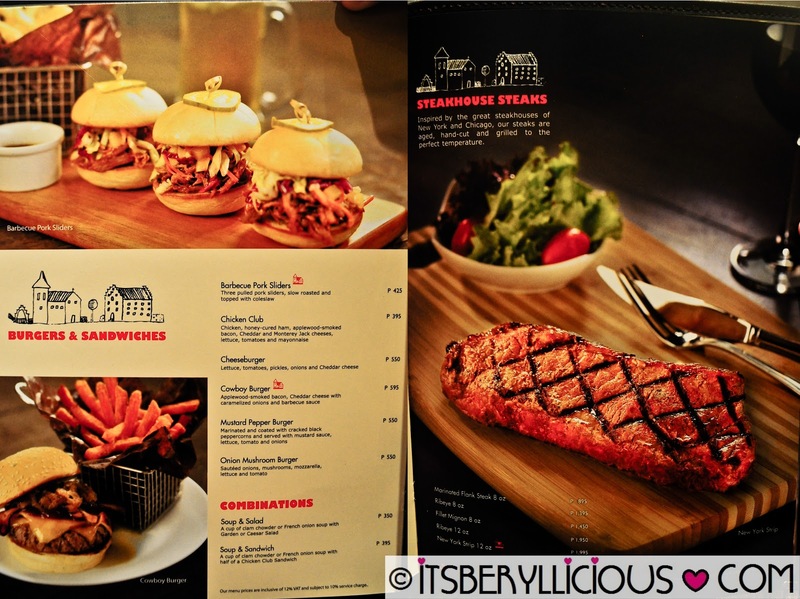 The dishes are just amazingly delicious especially the Black Angus Beef Steak. Food overload. I want to become a mainstay here, for free. lol! I would like to try the Banana Crepes, since when it comes to fruits, Bananas are the most tummy filling for me. although I must say that the price is a bit high. mouth watering! I am intrigued with the black pizza. yes, i think the squid ink is a better choice than charcoal. love the dessert. love the steak. they ALL look yummy! 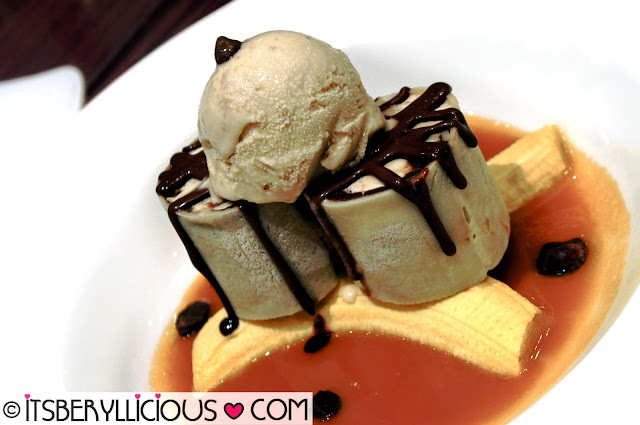 interesting pizzas, desserts and drinks. I wanna go for the Cowboy Burger one more time! That was one cool food trip!